This book is different from all other modern cosmology books in several ways. It introduces a cosmologic universe, which is orderly, logical, and systematic. It teaches and explains by illustrating how a variety of cosmic mysteries have been solved. 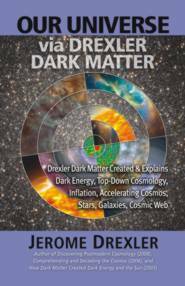 It raises the status of dark matter in the universe by illuminating its roles as the principal source of energy, the principal source of matter in the form of hydrogen and helium, and the principal source of cosmic relationships with the principal cosmic phenomena of the universe. This book simplifies the universe as Nicolaus Copernicus' book simplified the solar system in 1543. With more and more cosmic mysteries being discovered and the slow progress in solving them, cosmologists and astrophysicists must re-train themselves to understand and to utilize the postmodern unified astrophysical cosmology model and to maximize the knowledge derived from the astronomical data. These are the three principal objectives of this book. Jerome Drexler is a former member of the technical staff and group supervisor at Bell Labs, former research professor in physics at New Jersey Institute of Technology, founder and former Chairman and chief scientist of LaserCard Corp. (Nasdaq: LCRD). He has been awarded 76 U.S. patents, honorary Doctor of Science degrees from NJIT and Upsala College, a degree of Honorary Fellow of the Technion, an Alfred P. Sloan Fellowship at Stanford University, a three-year Bell Labs graduate study fellowship, the 1990 "Inventor of the Year Award" for Silicon Valley and recognition as the original inventor in 1978 of the now widely-used digital optical disk "Laser Optical Storage System" and the LaserCard(R) nanotech data memory. He is a member of the Board of Overseers of New Jersey Institute of Technology and an Honorary Life Member of the Technion Board of Governors.